Whether I am inside or outside, we are always looking for clean surfaces to sit and hang out. As a mother with young kids, I am also always on the go and when we do go out, we bring all the tools to be comfortable, whether watching a soccer game, park play or just a nice picnic. I have chairs that I bring to outings, but sometimes it's a great day and we want to hang out on the grass or sometimes, it's just too rushed to get the chairs and I grab one of our cushy blankets. The last time I grabbed a blanket to sit on the grass, there was water coming up from the wet ground. The ground did not look wet until we actually sat on it! Ew! So we sat on our shoes on the blanket. I LOVE the idea behind this mat and I honestly should have found something like this many years ago for my family. I really didn't think of it or that they had them available. The Monkey Mat is perfect for my needs. It will be perfect for your needs. And yes it is big enough for all the picnic baskets and for pets and family to enjoy sprawling out! I love the design. I love the color and most of all, I love the backing that will not allow water to come through on food and clothing. There is no spoiling frolicking on the ground with this mat, or I should say, there won't be any nasty surprises! Next Spring and Summer outings will be even better with this grab and go mat!! 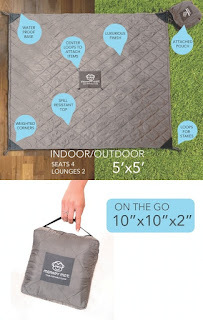 As seen on Shark Tank - 5' x 5' mat in attached 6" x 6" ultra compact pouch, so nothing gets lost and can go on any family adventure: beach, picnic, concert, travel, hikes, camping, sporting events, and so much more! Machine Washable - Machine wash warm, tumble low or hang dry; very quick drying. Exclusive features - Weighted corners for a breezy day, center loops allow for fun attachments (toys, keys, dog leash, etc). Corner loops for stakes (sold separately), buckle strap to latch onto any bag, cooler, stroller, belt, purse, bike handle, etc. 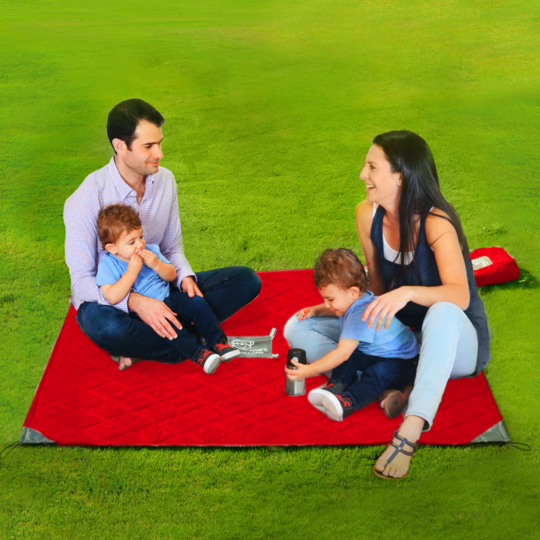 Multi-purpose/function - For in/outdoor use: sporting events, amusement and water parks, hiking, backpacking, soccer games, sun shade, indoor throw under highchair for easy clean up. Use the Monkey Mat to shield from unwanted dog hair or to cover a dirty picnic table. Great for an arts and craft table cover or transporting plants in car. The Monkey Mat makes for endless possibilities! 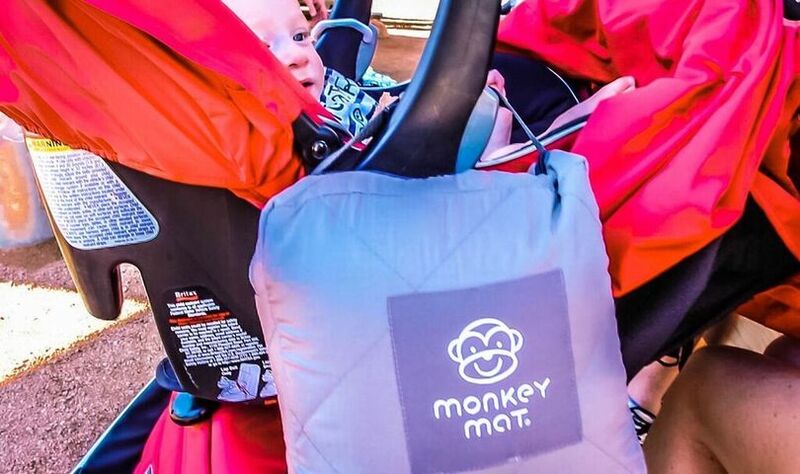 MONKEY MAT GUARANTEE - If you don't love it, return it for full refund! I received this mat to facilitate this review.